Wilms tumor, treatment for which includes surgery (radical or partial nephrectomy), is the fifth most common pediatric malignancy and the most common type of renal tumor in children. The outcome of current treatment for Wilms tumor is an example of success achieved through a multidisciplinary collaboration of the National Wilms' Tumor Study Group (NWTSG) and the Societe Internationale d'Oncologie Pediatrique (SIOP). Note the image below. Gross nephrectomy specimen shows a Wilms tumor pushing the normal renal parenchyma to the side. Fifty years ago, when Wilms tumor was treated with surgery alone, the survival rate 2 years after nephrectomy was 20%. The introduction of adjuvant radiotherapy raised the survival rate to 50% overall. Owing to the cooperative efforts of oncologists, surgeons, and pathologists and with the introduction of chemotherapy with vincristine, dactinomycin (actinomycin D), and doxorubicin, the overall survival rate since the late 20th century has risen to 90%. See Wilms Tumor: A Pediatric Oncology Success Story, a Critical Images slideshow, to help identify the clinical features, staging evaluation, prognostic factors, and therapeutic options for this disease. Wilms tumor arises from the primitive embryonal renal tissue. 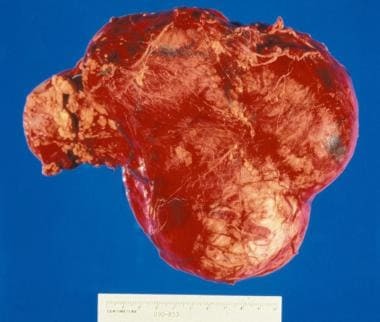 Grossly, Wilms tumor is typically an intrarenal solid or cystic mass, which may displace and, in rare cases, invade the renal collecting system. The tumor extends into the renal vein in 40% of cases. In very rare cases, it extends into the ureter and down to the bladder, where it may cause hematuria. Wilms tumor is bilateral in 6% of cases. Local invasion is rare and tumor spread is usually through lymphatic and vascular routes. Contraindications to primary surgery for Wilms tumor include bilateral tumors and documented metastatic disease. Large tumors that extend beyond the midline, have vascular extension, or both are relative contraindications, since some surgeons elect to obtain tissue via surgical excision, but this may expose patients to increased surgical risks. According to the NWTSG protocol, the first step in the treatment of Wilms tumor is surgical staging followed by radical nephrectomy, if possible. During the surgical staging procedure, exploration of the contralateral kidney is considered unnecessary because of the diagnostic reliability of current imaging techniques (computed tomography [CT] scanning, magnetic resonance imaging [MRI]). If imaging studies demonstrate bilateral disease, nephrectomy is not performed, but biopsy specimens are obtained. New protocols in the management of bilateral Wilms tumor are being explored. The role of partial nephrectomy remains controversial. Although end-stage renal disease after unilateral radical nephrectomy is uncommon (0.25% in the NWTSG trial), preserving healthy renal tissue may prevent this complication, especially in patients with an underlying intrinsic renal disease (eg, WAGR [Wilms tumor, aniridia, genitourinary anomalies, and mental retardation] syndrome, Denys-Drash syndrome). Partial nephrectomy may be feasible in only 10%-15% of patients, as most tumors are too large at initial diagnosis. The main concern regarding a nephron-sparing procedure is that of local recurrence. The NWTS-4 study showed an 8% local recurrence rate following partial nephrectomy for patients with bilateral disease. In the presence of bilateral Wilms tumors, solitary kidney, or renal insufficiency, partial nephrectomy is a reasonable consideration. If the tumor is unresectable, biopsies are performed and the nephrectomy is deferred until after chemotherapy, which, in most cases, will shrink the tumor. Contiguous involvement of adjacent organs is frequently overdiagnosed. The overall surgical complication rate for Wilms tumor is approximately 20%. If inferior vena cava (IVC) thrombus is present, preoperative chemotherapy will reduce the cavotomy rate by 50%. This approach dramatically reduces the renal failure rate following bilateral Wilms tumor therapy.The overall 2-year survival rate is higher than 80% with this approach, and the nephrectomy rate drops by 50% in patients with bilateral Wilms tumor. Bilateral partial nephrectomy is possible after chemotherapy or, if the tumor on one side responds completely to chemotherapy, with no subsequent need for nephrectomy. Chemotherapy without proper surgical staging (eg, staging by means of imaging studies only) may alter the actual initial stage of the disease by the time of surgery and may subsequently alter decisions regarding the adjuvant chemotherapy and radiation therapy, which is based on the surgical staging. Through a transperitoneal approach, mobilize the ipsilateral colon and enter the Gerota (perinephric) fascia to examine the kidney. In cases of a unilateral tumor, perform a radical nephrectomy if the opposite side is normal. Evaluate the liver, lymph nodes, and peritoneum for metastases. The renal vein and inferior vena cava should be palpated to assess intravascular extension (present in 6% of the cases). In cases of bilateral disease, excisional biopsy of visible tumor is indicated, followed by re-resection with nephron preservation after chemotherapy. Identify the involved nodes with clips to facilitate postoperative radiation therapy. Integrity of the surgical specimen is of paramount importance, as tumor spillage has a deleterious impact on prognosis (six-fold increase in local abdominal recurrence). Bilateral, high-stage tumors with unfavorable histology are associated with a poor prognosis in spite of multimodal therapy. Follow-up care after treatment must be long (if possible, lifelong), because Wilms tumor may recur after several years. Follow-up consists of chest radiography and abdominal ultrasonography, CT scanning, or MRI every 3 months for the first 2 years, every 6 months for another 2 years, and once every 2 years thereafter. Tumor biomarkers, histology, and stage are the most important prognostic factors in cases of unilateral disease. Approximately 5% of children with Wilms tumor will have bilateral involvement. In these patients, the goals of treatment are oncologic control plus preservation of renal parenchyma to ensure sufficient renal function. Renal insufficiency may adversely affect both overall health outcomes as well as quality of life. This impact may be especially pronounced in children with bilateral Wilms tumor, who are often younger than their counterparts with unilateral disease and may also be afflicted with syndromes associated with poor renal function at baseline. [30, 31] Bilateral disease is an independent risk factor for the development of renal insufficiency, due in large part to the loss of renal parenchyma. Using risk stratification based on the molecular profile of the tumor may allow treatment to be tailored for each patient individually. Clinical outcomes may be further improved with promising new cytotoxic agents, such as the camptothecin analogue topotecan. A promising class of chemotherapeutic drugs is the antiangiogenesis agents, which target the vascular endothelial growth factor (VEGF) pathway. What is the anatomy of Wilms tumor? When is surgery indicated in the treatment of Wilms tumor? What are the contraindications to surgery for the treatment of Wilms tumor? What is the role of radical nephrectomy in the treatment of Wilms tumor? What is the role of partial nephrectomy in the treatment of Wilms tumor? What is the role of laparoscopic nephrectomy in the treatment of Wilms tumor? What is the role of robotic-assisted laparoscopic surgery (RAS) in the treatment of Wilms tumor? How are unresectable Wilms tumors treated? How are bilateral Wilms tumors treated? What is the role of chemotherapy in the treatment of Wilms tumor? How is radical nephrectomy performed for the treatment of Wilms tumor? What are the NWTSG guidelines on postoperative chemotherapy and radiotherapy for Wilms tumor? What is a stage V Wilms tumor? What is included in the long-term monitoring of Wilms tumor? What is the prognosis of Wilms tumor? What is the prognosis of bilateral Wilms tumor? Which treatments are under investigation for Wilms tumor? Ehrlich PF, Ritchey ML, Hamilton TE, et al. Quality assessment for Wilms' tumor: a report from the National Wilms' Tumor Study-5. J Pediatr Surg. 2005 Jan. 40(1):208-12; discussion 212-3. [Medline]. Kubiak R, Gundeti M, Duffy PG, Ransley PG, Wilcox DT. Renal function and outcome following salvage surgery for bilateral Wilms' tumor. J Pediatr Surg. 2004 Nov. 39(11):1667-72. [Medline]. Duarte RJ, Cristofani LM, Odone Filho V, Srougi M, Dénes FT. Videolaparoscopic radical nephrectomy after chemotherapy in the treatment of Wilms' tumor: Long-term results of a pioneer group. J Pediatr Urol. 2017 Feb. 13 (1):50.e1-50.e5. [Medline]. Vanden Berg RN, Bierman EN, Noord MV, Rice HE, Routh JC. Nephron-sparing surgery for Wilms tumor: A systematic review. Urol Oncol. 2016 Jan. 34 (1):24-32. [Medline]. [Full Text]. Haecker FM, von Schweinitz D, Harms D, Buerger D, Graf N. Partial nephrectomy for unilateral Wilms tumor: results of study SIOP 93-01/GPOH. J Urol. 2003 Sep. 170(3):939-42; discussion 943-4. [Medline]. Holcomb GW 3rd, Tomita SS, Haase GM, et al. Minimally invasive surgery in children with cancer. Cancer. 1995 Jul 1. 76(1):121-8. [Medline]. Varlet F, Reinberg O, Becmeur F, GECI. Laparoscopy et cancer chez l'enfant. J coeliochir. 2001. 37:27-32. Leclair MD, Sarnacki S, Varlet F, Eloury Y. Minimally invasive surgery in children with cancer. Bull Cancer. 2007. 94:1087-90. [Medline]. Burnand K, Roberts A, Bouty A, Nightingale M, Campbell M, Heloury Y. Laparoscopic nephrectomy for Wilms' tumor: Can we expand on the current SIOP criteria?. J Pediatr Urol. 2018 Feb 13. [Medline]. Duarte RJ, Denes FT, Cristofani LM, Giron AM, Filho VO, Arap S. Laparoscopic nephrectomy for wilms tumor after chemotherapy: initial experience. J Urol. 2004 Oct. 172(4 Pt 1):1438-40. [Medline]. Duarte RJ, Denes FT, Cristofani LM, Odone-Filho V, Srougi M. Further experience with laparoscopic nephrectomy for Wilms' tumour after chemotherapy. BJU Int. 2006 Jul. 98(1):155-9. [Medline]. Varlet F, Petit T, Leclair MD, Lardy H, Geiss S, Becmeur F, et al. Laparoscopic treatment of renal cancer in children: a multicentric study and review of oncologic and surgical complications. J Pediatr Urol. 2014 Jun. 10(3):500-5. [Medline]. Duarte RJ, Denes FT, Cristofani LM, Srougi M. Laparoscopic nephrectomy for Wilms' tumor. Expert Rev Anticancer Ther. 2009 Jun. 9(6):753-61. [Medline]. Kim C, McKay K, Docimo SG. Laparoscopic nephrectomy in children: systematic review of transperitoneal and retroperitoneal approaches. Urology. 2009 Feb. 73(2):280-4. [Medline]. Mahomed AA, Hoare C, Welsh F, Driver CP. A two-center experience with the exclusive use of laparoscopic transperitoneal nephrectomy for benign renal disease in children. Surg Endosc. 2007 Sep. 21(9):1532-6. [Medline]. Sweeney DD, Smaldone MC, Docimo SG. Minimally invasive surgery for urologic disease in children. Nat Clin Pract Urol. 2007 Jan. 4(1):26-38. [Medline]. Harrell WB, Snow BW. Minimally invasive pediatric nephrectomy. Curr Opin Urol. 2005 Jul. 15(4):277-81. [Medline]. Javid PJ, Lendvay TS, Acierno S, Gow KW. Laparoscopic nephroureterectomy for Wilms' tumor: oncologic considerations. J Pediatr Surg. 2011 May. 46(5):978-82. [Medline]. Van Batavia JP, Casale P. Robotic surgery in pediatric urology. Curr Urol Rep. 2014 May. 15(5):402. [Medline]. Liu G, Zhang Y, Fu K, Hu J, Zhao Z, Fu W, et al. Meta-analysis of the effect of preoperative chemotherapy on Wilms' tumor. J BUON. 2018 Jan-Feb. 23 (1):211-217. [Medline]. Pritchard-Jones K, Bergeron C, de Camargo B, van den Heuvel-Eibrink MM, Acha T, Godzinski J, et al. Omission of doxorubicin from the treatment of stage II-III, intermediate-risk Wilms' tumour (SIOP WT 2001): an open-label, non-inferiority, randomised controlled trial. Lancet. 2015 Sep 19. 386 (9999):1156-64. [Medline]. Kalapurakal JA, Nan B, Norkool P, Coppes M, Perlman E, Beckwith B, et al. Treatment outcomes in adults with favorable histologic type Wilms tumor-an update from the National Wilms Tumor Study Group. Int J Radiat Oncol Biol Phys. 2004 Dec 1. 60(5):1379-84. [Medline]. Grundy PE, Breslow NE, Li S, Perlman E, Beckwith JB, Ritchey ML, et al. Loss of heterozygosity for chromosomes 1p and 16q is an adverse prognostic factor in favorable-histology Wilms tumor: a report from the National Wilms Tumor Study Group. J Clin Oncol. 2005 Oct 10. 23(29):7312-21. [Medline]. Ehrlich PF. Bilateral Wilms' tumor: the need to improve outcomes. Expert Rev Anticancer Ther. 2009 Jul. 9(7):963-73. [Medline]. Dome JS, Cotton CA, Perlman EJ, Breslow NE, Kalapurakal JA, Ritchey ML, et al. Treatment of anaplastic histology Wilms' tumor: results from the fifth National Wilms' Tumor Study. J Clin Oncol. 2006 May 20. 24(15):2352-8. [Medline]. Fuchs J, Kienecker K, Furtwangler R, et al. Surgical aspects in the treatment of patients with unilateral wilms tumor: a report from the SIOP 93-01/German Society of Pediatric Oncology and Hematology. Ann Surg. 2009 Apr. 249(4):666-71. [Medline]. Breslow N, Olshan A, Beckwith JB, Green DM. Epidemiology of Wilms tumor. Med Pediatr Oncol. 1993. 21(3):172-81. [Medline]. Kieran K, Williams MA, McGregor LM, Dome JS, Krasin MJ, Davidoff AM. Repeat nephron-sparing surgery for children with bilateral Wilms tumor. J Pediatr Surg. 2014 Jan. 49(1):149-53. [Medline]. McKenna AM, Keating LE, Vigneux A, Stevens S, Williams A, Geary DF. Quality of life in children with chronic kidney disease-patient and caregiver assessments. Nephrol Dial Transplant. 2006 Jul. 21(7):1899-905. [Medline]. Breslow NE, Collins AJ, Ritchey ML, Grigoriev YA, Peterson SM, Green DM. End stage renal disease in patients with Wilms tumor: results from the National Wilms Tumor Study Group and the United States Renal Data System. J Urol. 2005 Nov. 174(5):1972-5. [Medline]. [Full Text]. Owens CM, Brisse HJ, Olsen OE, Begent J, Smets AM. Bilateral disease and new trends in Wilms tumour. Pediatr Radiol. 2008 Jan. 38(1):30-9. [Medline]. Davidoff AM, Giel DW, Jones DP, et al. The feasibility and outcome of nephron-sparing surgery for children with bilateral Wilms tumor. The St Jude Children's Research Hospital experience: 1999-2006. Cancer. 2008 May 1. 112(9):2060-70. [Medline]. Sulkowski J, Kolon T, Mattei P. Nephron-sparing partial nephrectomy for bilateral Wilms' tumor. J Pediatr Surg. 2012 Jun. 47(6):1234-8. [Medline]. Piche N, Barrieras D. Minimally invasive nephron-sparing surgery for unilateral Wilms tumor. J Pediatr Surg. 2012 Jul. 47(7):E1-4. [Medline]. Kern AJ, Inouye B, Ko JS, et al. Impact of nephrectomy on long-term renal function in non-syndromic children treated for unifocal Wilms tumor. J Pediatr Urol. 2014 Aug. 10(4):662-6. [Medline]. Wang HH, Abern MR, Cost NG,et al. Use of nephron sparing surgery and impact on survival in children with Wilms tumor: a SEER analysis. J Urol. 2014 Oct. 192(4):1196-202. [Medline]. [Full Text]. CT scan in a patient with a right-sided Wilms tumor with favorable histology. CT scan of child with a stage IV Wilms tumor with favorable histology. Note the bilateral pulmonary metastases.